Over the past several years I have enjoyed the versatility of using a switch rod on large streams. When you learn to cast a switch rod opportunities increase for the fly fisher. The magic lies in the fly line itself much more than the rod. I had already been using Spey variety casts on the stream most of my angling life. These include casts named the snake roll, snap T, circle casts, perry poke, single and double Spey, and many others. The aerial cast is also used similarly to single hand rods when needed. The particular cast one uses on the stream tends to be the one which requires the minimal amount of setup as well as adheres to keeping all of the delivery casts downwind. We have had three days in a row lately with strong cold front passing with gusts 30-50 mph! Learn to cast a switch rod offers BIG advantages for youth and elderly. 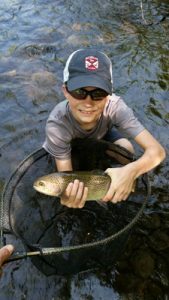 The switch rod advantages include active presentations such as streamers of all sizes down to wee wet flies. Comfort in a single word is why I would recommend pursuing a switch rod for your fly fishing rod collection. You can swing flies to cover vast amounts of water at ease with roll casts out 100+ feet! Large rivers often become difficult to wade where you want to make delivery casts. The water is often either too fast or deep to wade. The solution is using a switch rod to cover these locations because often times using an active presentation is the quickest method for attaining big fish numbers on the stream. The fly fisher can also use passive presentations on the stream using the switch rod which includes the dreaded by many “dead drift”. I say dreaded because it no doubt requires the greatest amount of effort for anglers to perfect on stream. This implies the flies are free to drift exactly as the currents in which it rides. Dead drift presentations can be applied to wets, nymphs, streamers, and dry flies. The line I have been using weighs 450 grains with a head of about 45 feet. We have Blue Wing Olives pouring off with regularity around 1:00 to 3:00 P.M. daily. We target rising fish during this activity in the afternoons with the switch rod! 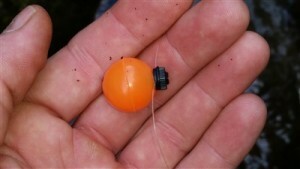 It actually makes it much easier to target rising trout at a distance using the switch rod! You can attach yarn, foam, or whatever favorite bobber you enjoy using for nymphing at a distance. The line control for mending at a distance becomes much easier using the 450-grain line. Then proceed to dead drift your nymphs for probably the longest floats possible with the exception of center pinned reels. I have always viewed float times like simple statistics in that the longer you can keep the drift drag free than it will usually lead to greater hookups! The other benefit of the switch rod for my line geek friends is that you can build a leader wallet to include mini heads that you interchange on the tip of the line. These mini heads are no different than the lake lines we use for a variety of densities. The tips have varying sink rates from 1 inch per second to usually about 11 inches per second. The advantages of this imply you can fish many setups of patterns that are all unweighted and simply change tips. It is my sincere hope that this piece gets another convert to the switch rod revolution! Learn to cast a switch rod and open up the many opportunities on the water! Since the majority of the casts used with switch rods rely heavily on roll casts, it will help you in your journey of becoming a roll casting ninja!